I came across this comic a few years ago. This is Whodunnit? by Mark Evanier and Dan Spiegle. I got it from the quarter bin at a comics store in the States. 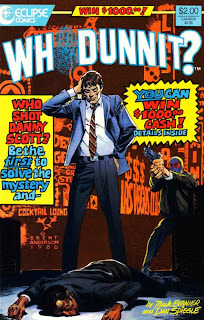 It looked mighty interesting because of the Brent Anderson cover, and even though I knew I no longer qualified for the $1,000.00 prize (if anyone did, I'd like to know who it was), I thought I could find the answer on the Internet. I was wrong. If anyone knows who shot Danny Scott, please let me know. If you so happen to run across Whodunnit #2 going for, say, 25 cents, that'd be cool too. More detective serials like these would be great though; I wish the market could handle diversity of genre. I remember seeing this title in a Comic shop back when I lived in Florida. I don't remember what issue it was but, I definitely remember that title style. I can't even remember if I had any Eclipse titles in my old collection. I got it for free with an order I made to I think it was 4colorheroes a few years ago. 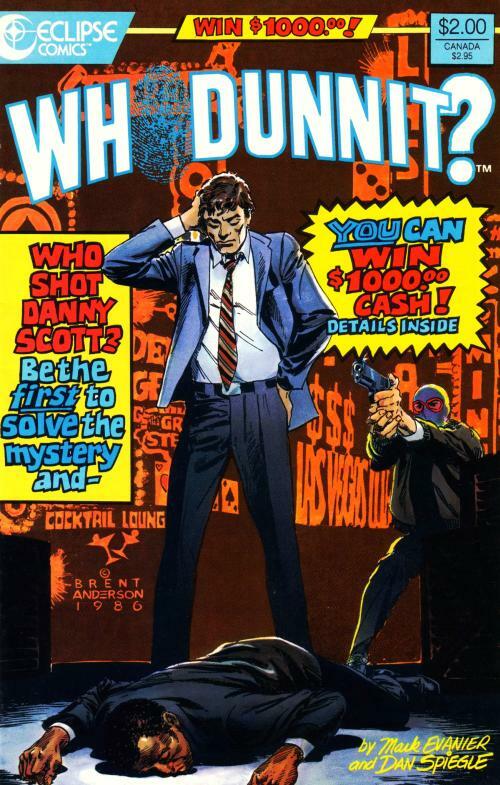 I STILL don't know who shot Danny Scott, and even if I had an answer, it'd still bug me not knowing for sure. I even emailed Mark Evanier about it, but no answer. I really want to know!